lpg wrote: Kreisoft is excellent for MAC repair. They are located on Serdan between Rosales and Allende. He comes to LaVentana... on certain days. 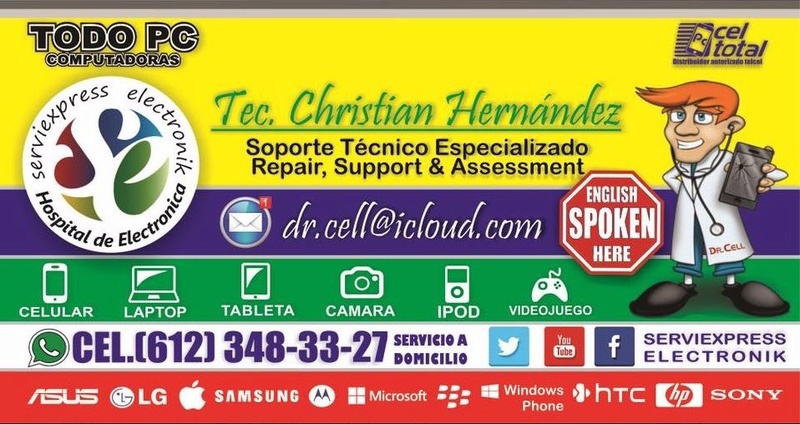 There at least two shops that do iPhone repairs on Colosio. They are on the right as you go from Abasolo. One is just before El Gallo a big hardware store painted predominantly red ( I had my iPhone 4 screen that had been smashed replaced there over night and then there is a bigger shop that is one of the best techno shops in La Paz it is on the corner about two blocks before you get to the town hall. I am not sure but I think its called Mas electronics. or similar. They do iPhone repairs but I have not had direct experience of them other than buying other electronic stuff. LPG wrote: malcolm, i've used MANUEL BELTRAN for 8 yrs. comes to your house and he's kept 6 older macbooks running just fine. like robert say's kreasoft is also authorized but usually needs the computer for a week or so. manuel is punctual, speaks pretty good english, and a heck of a nice guy. his phone 612 104 8290. i also copied him in so you have his email. i call, text or email and he's on it!! Friday I delivered a Mac to PC La Paz for a friend. One hour later, I got an email from their computer repair person, Peepe, saying it was fixed. And I had just had a similar experience with my own laptop... thought it was dead... but now it works better than new! The owner Sergio Alberto Mendoza Castro and his brother speak excellent English. Peepe speaks some English. Expert, affordable, reliable, fast... just the best! I lost my power supply in my Dell computer. Not knowing were to take it we went to La Paz and started a one day journey looking for a repair shop. We had great luck. We found a shop that specializes in Dell repairs. The name of the shop is CBC located on Altamirano 1/2 block west of 16 Septiembre and on the north side of Altamirano. The owners name is Manuel Olachea, the phone number is 1230897.
good English. The Computer Guy.